In 1916 John Marston retired from Sunbeam and he died in 1918. His son Charles then had to deal with the problem of paying death duties on the estate, that tax having been recently introduced. He also wanted to deal with the fact that he had many interests outside industry. He therefore sold off Sunbeam to a group of munitions makers who had done well out of the war and wanted somewhere to put their patriotic gains. Charles kept Villiers Engineering but, in or about 1919, he left the active day to day management of the company. He remained as Chairman but Frank Farrer, as Managing Director, became the leading light. Charles took as active an interest in the affairs of the firm as his other interests allowed. Indeed he was involved in Villiers' attempt to produce a car in 1926. He carefully examined Cadillac, Ford, Chrysler and Piece Arrow, apparently thinking that there would be a market for a high quality, medium sized car produced on modern production line. Villiers employed Leslie Farrer, Frank's nephew, who had been with Austin, to develop the idea. Three prototypes were built but then the project was abandoned on the grounds that competition in the market was too great. They were probably right. This was not the time for a new car manufacturer to appear or even for old ones to expand as, locally, Star and Clyno were to discover. But Marston spent most of his time in politics, mainly as a prominent supporter of the Conservative Party, turning down offers to stand for Parliament. Charles also had God on his side, and spent a great deal of money financing archaeological expeditions to the Holy Land, the purpose of which was to prove the truth of the Bible. He seems to have thought that if you can prove the truth of the those parts of the Bible which dealt with this history of this world then, somehow, that would also prove the truth of those parts of the Bible that dealt with the other world. These activities eventually gained him a knighthood for "public services" in 1926. He continued as Chairman of Villiers until his death in 1946. An advert from 1950 for a lawnmower powered by 98cc Villiers engine. This advert appeared in a 1928 motorcycling magazine. It seems that the show of leg was not an attention grabber for males but that the advert was designed to draw attention to lightweight machines for women - perhaps a risky exercise at the time but presaging Villiers' concern with transport for everyone. 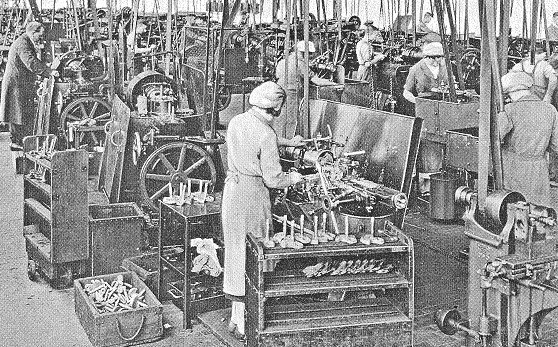 After the Great War there was a large expansion of the works after along the newly constructed Marston Road, new buildings were put up and the production capacity of the factory considerably increased. The policy of the company was to make nearly every component themselves, in order to maintain the closest possible control over quality, as well as to increase their own profits. Thus the post-war additions included a foundry producing castings in aluminium, bronze and gunmetal. It was said that raw materials went in at one end and finished engines came out at the other. 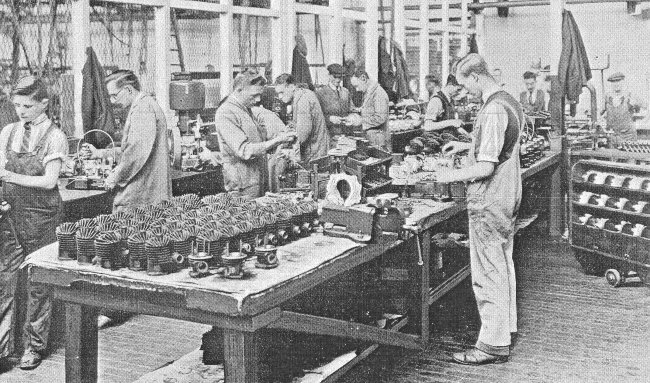 A separate factory was given over to the production of freewheels and sprockets - which latter had been added to the range. 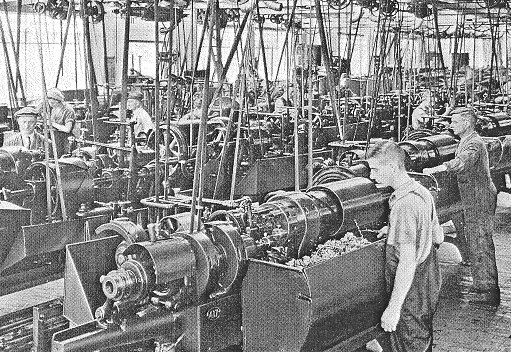 Automatic machinery and other modern equipment was installed to meet the increasing demand, and one of the new machine shops was built in four months to cope with the pressure of orders. 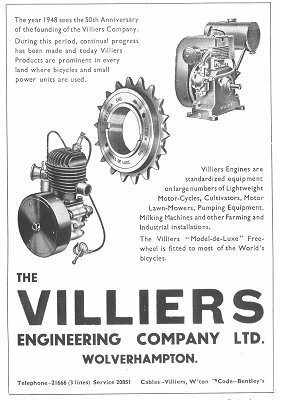 Up to this time Villiers two-stroke engines were made primarily for motor-cycles, although used in their standard form for invalid carriages, lawn mowers and small runabouts, whatever the ingenuity of other manufacturers called for. All of these uses seem to have started in 1919 when a standard 269cc engine was adapted to drive a lawn mower. This proved technically and commercially successful and lead to the production of a range of two stroke engines designed for such purposes. One of their most famous uses was for Seagull outboard engines. But Villiers would also modify their engine to meet the particular requirements of customers. 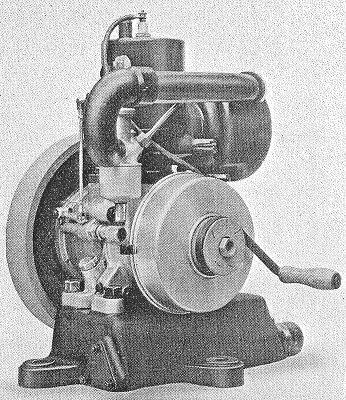 Villiers also designed a range of fan-cooled two-stroke stationary industrial engines which also met with success. 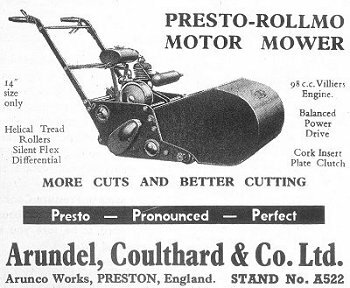 As an advert (left) claims, their engines were used in "motorcycles, cultivators, motor lawn-mowers, pumping equipment, milling machines and other farming and industrial installations". Villiers had always claimed that they made engines which made it possible for the working class man to buy his own transport. Just before the Second World War the company produced a 98 c.c. 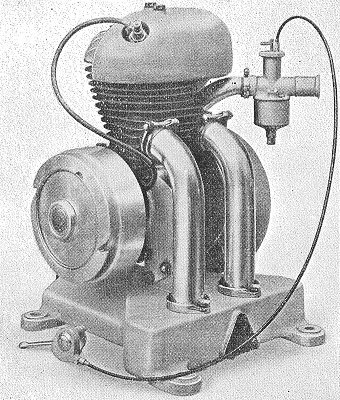 engine for autocycles, and persuaded other manufacturers to make suitable machines to which it could be fitted. The autocycle found a very big market, with its reliable engine, and up to 1948 over 100,000 Villiers-engined auto-cycles had been sold. An advert from 1948, claimed as the 50th anniversary of the company. It includes a motor cycle engine, stationary engine and a freewheel. 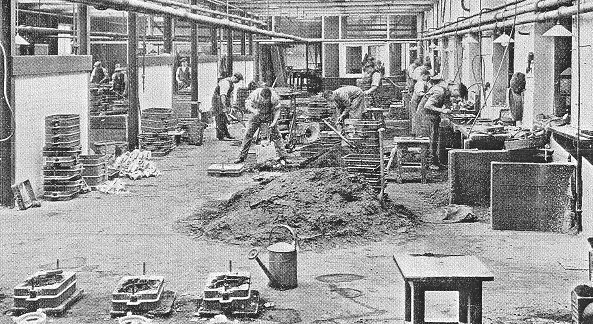 In a recent visit which we paid to the Marston Road Works of the Villiers Engineering Company, Ltd., at Wolverhampton, our attention was drawn to the fact that in addition to producing a weekly output of tens of thousands of free wheels and sprockets, the firm has a manufacturing capacity of no less than 1,100 small two-stroke engines per week. The works have been newly built and planned, and are complete with the latest specialised machinery for their work, and some account, therefore, of their history, their technical equipment, and the engines manufactured will, we feel, be of interest to many of our readers. Plan of the Marston Road Works. The Villiers Engineering Company, Ltd., was formed in 1898, and its original works were on small premises in Upper Villiers Street, Wolverhampton. 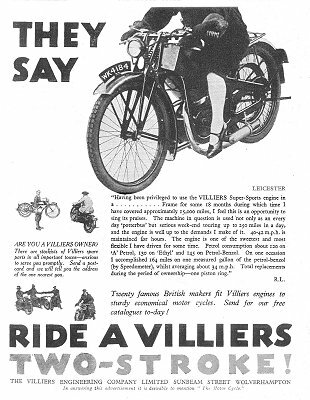 Its first products, were pedals for bicycles, but the making of these was later discontinued, and in 1904 the manufacture of Villiers free wheels was begun. That side of the firm's activities has continued to increase steadily, and today the company is, we are given to understand, one of the largest manufacturers of free wheels in the world. That the firm has not stood still in this side of its work is shown by the fact that there is being exhibited at the nineteenth International Bicycle and Motor Cycle Show at Olympia this week a new type of Villiers two-speed gear. It consists of two sprockets mounted on the rear hub of a cycle, and connected by a free wheel, so that one sprocket can overrun the other. The drive from the main sprocket is transmitted through two further sprockets mounted on a countershaft, and by means of three driving pins the hub sprockets can be run independently or connected, this action representing a change of gear, giving an increase of speed of about 25 per cent. It is, however, rather with the engine side of the firm's work that we propose to deal. The first Villiers internal combustion engine using petrol was produced in 1912, and was a small single-cylinder, four-stroke unit with an overhead inlet valve which worked in conjunction with a two-speed gearbox. That design was, at that date, the directors felt, somewhat ahead of its time, and it was immediately decided to produce a very simple two-stroke engine, which was built shortly afterwards in the same year. Since that time the firm has concentrated on the production of two-stroke engines alone, and from small beginnings, when a good deal of prejudice had to be overcome, the demand for such engines has steadily increased, and now requires a works capacity of 1,100 engines per week. We shall describe later some of the principal engine types, and enumerate some of the varied uses to which they are put. Before doing so, however, reference may be appropriately made to the firm's patented flywheel magneto, which forms an integral part of Villiers engines, and is fitted to many engines, both industrial and marine, of other makes. The early Villiers engines were all equipped with horseshoe pattern flywheel magnetos, which at that time were principally produced in Germany. 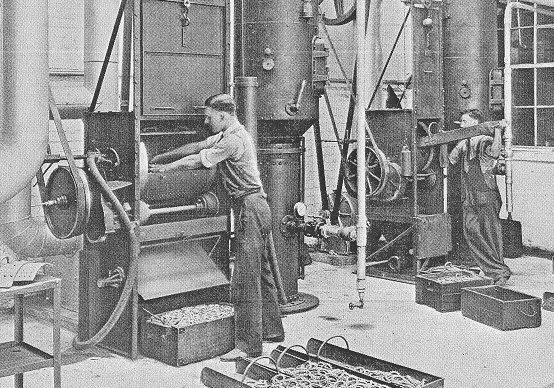 During the war period, however, the firm started to manufacture its own magnetos, and after careful consideration it was decided to adopt a flywheel type, which, as the engine was already fitted with a flywheel which would house it, saved a projecting bracket, a chain, and two driving sprockets. After extensive experiments, the Villiers flywheel-type magneto was adopted in 1919 as standard equipment on all engines, and is now supplied for all British outboard-type marine engines, and for several Continental makers of similar motors. The drawing of this device above, shows the general robust construction adopted, with the large coils and magnets, and the absence of all delicate parts. The magnetos, which we inspected in course of assembly and testing, gave an intense hot spark, which, in these small engines, ensures easy starting with reliable running under varying loads. The foundry, which is specially equipped to deal with repetition aluminium alloy and bronze work, is accommodated in the old Villiers Street works. We noted the general high standard of the castings produced and the good finish secured. The engine and freewheel works is complete with its own stamp shop, which accommodates ten drop hammers fed by oil-fired furnaces. The parts are drop forged from strip bar and after machining and finishing pass to the hardening department. The general and automatic machine shops are equipped with power presses, milling machines, and full-automatic and semi-automatic special purpose lathes and machines which nave been specially designed to manufacture commercially all the component parts required down to the smallest pin, nut, or washer. These parts are subjected to a single high-grade standard of supervision throughout the different processes of manufacture and assembly. About eight years ago the Villiers Engineering Company, Ltd., decided to produce its own type of carburettor, specially adapted to the needs of the small two-stroke engine and designed to give a compensated mixture over the whole range of power of the unit. These and other detailed parts called for an increase in the machinery capacity of the plant, and in order to meet the new requirements a separate machine shop, specially equipped for producing the small components and screws from bar, &c., was built and equipped only last year. As the machine tools are largely occupied on repetition work, a particularly well-equipped tool department is maintained, and there is a die sinking department to deal with special stamping dies. Attention has been specially paid to appropriate finishes for the engines and their component parts, and we noted that many of the brass and bronze components were being finished by dull chromium plating, while in certain other instances polishing was resorted to. This finishing work is carried on in special sections of the factory. An important new section which has recently been put to work and which supersedes the original sand blasting equipment is the shot blasting department, equipped by Tilghman's Patent Sand Blast Company, Ltd., of Broadheath, near Manchester. The plant consists essentially of a rotating barrel which is mounted upon four rubber-covered rollers and is belt driven through spur gearing. The barrel itself is furnished with a removable door, through which the castings, stampings, or other components to be cleaned are introduced. After it has been loaded and the door fastened the contents are tumbled and at the same time are brought under the action of shot blast jets. As the barrel is formed of perforated steel plates the abrasive material can fall into a hopper arranged below the barrel, from which it is drawn up into a cyclone separating chamber by the suction of the fan. When the shot has been separated from the dust it falls for re-use into the shot blast machine below, which is controlled by the setting of the operating levers. The abrasive is carried along an interior mixing tube and is delivered by compressed air through the jets into the barrel. Meanwhile the lighter dust is taken from the top of the cyclone to a rigid screen type dust collector in which the dust is arrested and is collected in bags which are periodically emptied. Clean air passes through the screens of the dust collector and into the suction of the exhaust fan and is delivered again to the atmosphere through the exhaust fan outlet. Brief reference may also be made to the method of engine assembly. The completed components and other parts, such as magnetos and carburettors, pass direct to finished stores, from which they are drawn in batches for assembly. We observed that following the very close inspection during manufacture very little further adjustment or fitting was needed, and that practically as soon as the engines left the assembly bench they ran smoothly on the test bench, which is modelled on automobile factory lines. Besides a standard range of petrol engines specially designed for motorcycle work, which we do not propose to refer to, the firm manufactures a wide range of small power units, both air-cooled and water-cooled, which have found the widest world use. In addition to pumping, ventilating, air compressing, and lighting plants, industrial driving, and so on, there is a large range of agricultural engineering uses, including the driving of forestry saws, fruit-spraying plant, and rabbit-exterminating machines, in which the exhaust gases of the engines are turned to use. The engines are also used as auxiliaries on transport vehicles, for starting other gas and oil engines, for field telegraph sets and for other services. 3½ hp. Air-Cooled, and 1½ hp. Water-Cooled Engines. "Mar-Vil" 0.6 B.H.P. Engine. One of the smallest engines Villiers have built, the "Mar-Vil" units, have a designed output of 0.6 B.H.P. at 1750 r.p.m., with a speed range of 1,200 to 1,800 r.p.m. The horizontal cylinder has a bore of 2in. with a stroke of 1½ in. Our drawing shows clearly the neat arrangement of the principal parts, including the compact flywheel-type magneto previously referred to, and the firm's special carburettor. The arrangement of the flywheel is such that not only does it protect the magneto from water and dust, but also forms an efficient fan for cooling the ribbed cylinder head, which is made in an aluminium alloy. Cast iron is employed for the piston, which carries two pressure rings, and an inertia ring. Lubrication of the cylinder is effected by adding oil to the petrol in the proportion of about 1 part of oil to 16 of spirit. The ball-bearing crank shaft may be noted. The engine is governed by a specially designed regulating device incorporated within the magneto, and it is equipped with a novel type of recoil spring starting handle. A fuel tank is formed within the base of the engine, and has sufficient capacity for about 2¾ hours running. The complete weight of the engine, including the tank, is only 29¾ lb. There is also a larger water-cooled model, which is made in two sizes designed to develop 1.5 B.H.P. at 1,000 r.p.m., with a bore of 67 mm. and a stroke of 70 mm., corresponding to a cylinder capacity of 247 c.c., and 2.6 B.H.P. at 1,400 r.p.m., the corresponding bore and stroke being 79 mm. and 70 mm., with a capacity of 343 c.c. Attention may be drawn to the design of the lipped piston, and the expansion chamber, which leads by a tube into a base-type silencer, which gives, we observed, a very quiet exhaust. The cooling water spaces are quite large, and they can be easily cleaned. The carburettor is furnished with a mixture control cam, and is attached directly to the cylinder casting. We may mention the provision of a single thin ring, called the inertia ring, above the top of the first pressure ring on the piston. This ring is free to rotate and to move up and down slightly, and it has been found to be very effective in keeping the rings free from gumming deposits. 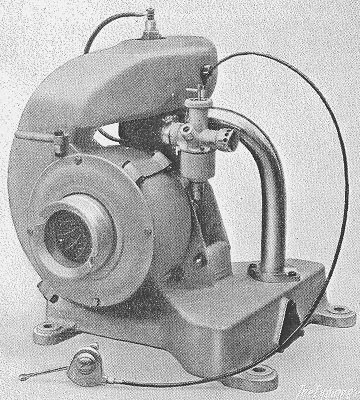 The governor is of the centrifugal crank-shaft pattern, and it acts directly on the carburettor through link gear. The extensive use of ball and roller bearings may be noted.